Make some new friends and get your hair cut all in one visit. Schedule an appointment with Major League Barbers, a respectable community-centered barbershop that services a diverse clientele of families, young men, and children. Our shop is a great place to relax with friendly faces and hold conversations. We are proud to maintain a family-friendly environment for you to take your little ones for their first haircut. Even college kids and people from local Universities, Vermont, Maine, and all of New England become regulars after we give them a great cut. Our owner has been cutting hair for more than 20 years. He found the art of cutting hair to be an escape from his rough environment. His passion for the business grew as he learned the skills to be a successful barber. The welcoming atmosphere and cleanliness of our shop leaves you with a positive experience that will keep you coming back every time you need a haircut. Major League Barbers attracts new customers all the time through word of mouth from our regulars. 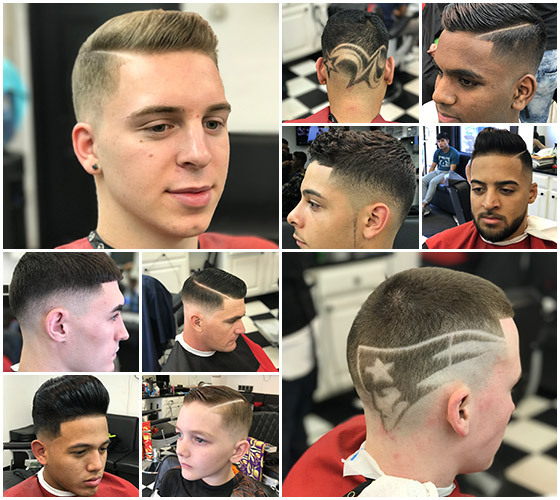 Loyal customers from all over New England stop by for an appointment at our shop conveniently located off of the Everett Turnpike. Our artists do not take shortcuts in giving you the best look. We're able to cut your hair any way you like with complete detail and accuracy. Visit us for your own authentic VIP barbershop experience. They do the best work and never a long wait. Make you feel at home. ©2018 Major League Barbers - Do not copy. All rights reserved.